The secondary structure of a Hammerhead Ribozyme (HHR). Arrow indicates position of cleavage between third and first stem. First and second stem are stem loops while stem three is open. Another ribozyme that is related to the HHR is the hepatitis δ virus ribozyme (HDV).Sharmeen1988 In contrast to the HHR it cleaves itself off a RNA at a specific position without a recognition site and without leaving a scar. This advantage of being independent from an upstream sequence makes it widely applicable and thus is used in our new BBF RFC 110 that aims to simplify and standardize the use of functional RNA. 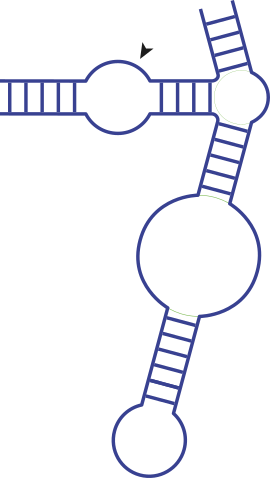 Naturally occurring Hairpin Ribozyme with cleavage site indicated by arrow. Our idea of working with functional nucleic acids originated from this system. We were fascinated by the vast variety of processes that they can perform and started digging deeper into the potential of nucleic acids as tools. 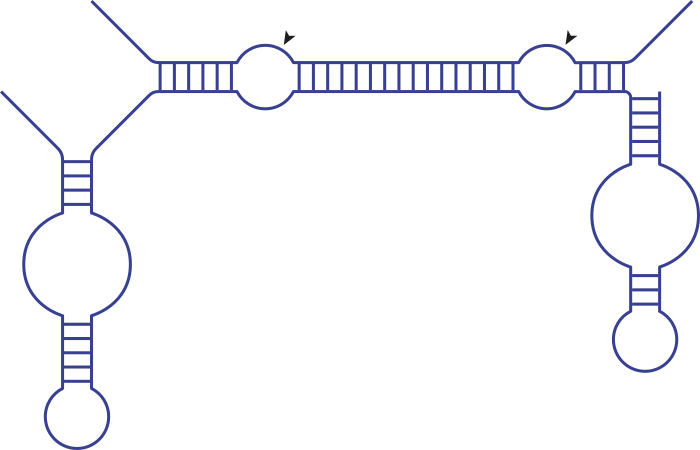 During this process we came across interesting systems amongst which we found the twin ribozyme (Fig. 3). Another famous hairpin-ribozyme-derived functional nucleic acid developed by Müller.Schmidt2000 It is able to specifically cleave a RNA at two designed specific positions and afterwards re-ligate it. Balke Balke2014 applied the twin ribozyme as tool to edit mRNA in vitro.Balke2014 In our project we want to use this system to specifically repair the mutation in a mRNA leading to the malfunction of a protein. The function of the protein is restored by inserting the missing bases and thus the patients symptoms disappear. Next to the directed evolution of existing ribozymes in vitro selection methodsBartel1993 were developed to select nucleic acids with new catalytic activities from a random pool. Catalytic RNA of versatile functions arose from these methods. For instance Seelig and Jäschke selected a diels alderase ribozyme catalyzing the Diels-Alder reaction leading to the formation of a carbon-carbon bond.Seelig1999 Not only can in vitro selection methods be applied to reveal new catalytic RNA but also to select aptamers. Secondary structure of the Twin Ribozyme. With cleavage and ligation sites indicated by arrows. The Hairpin Ribozyme is derived from the Hairpin Ribozyme. 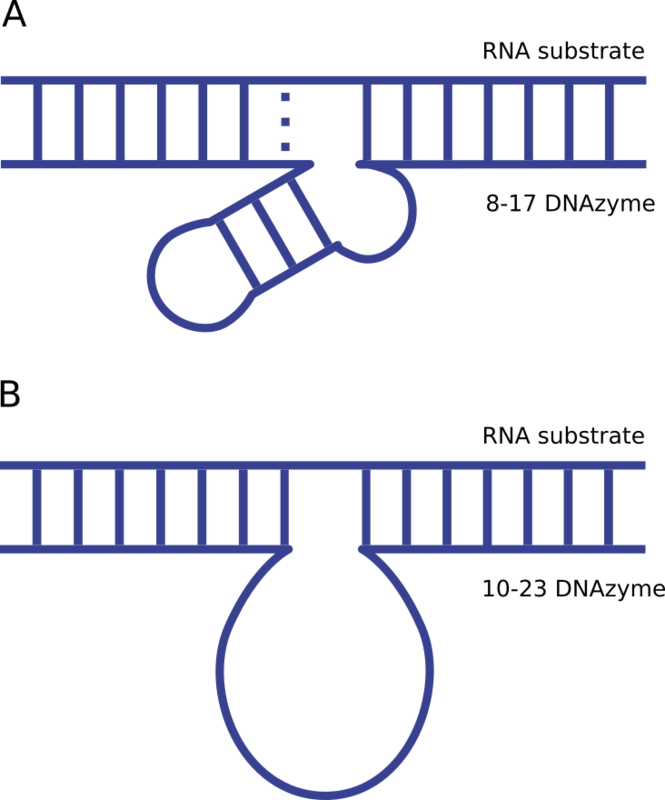 Aptamers are RNA or DNA sequences that can selectively bind to a ligand or target. Scientists have selected a variety of aptamers for small molecules ranging from theophylline (Fig. 4A) being one of the first described aptamersJenison1994 over ATPSassanfar1993 to an aptamer for the protein thrombinBock1992. Both catalytic nucleic acids and aptamers are as for today selected via systematic evolution of ligands by exponential enhancementJoyce1989Ellington1990Tuerk1990Bartel1993 also known as SELEX (Fig. 5). It is a very time consuming and expensive process. Many cycles of selection from a random pool of sequences have to be performed in order select the best candidates in each round. 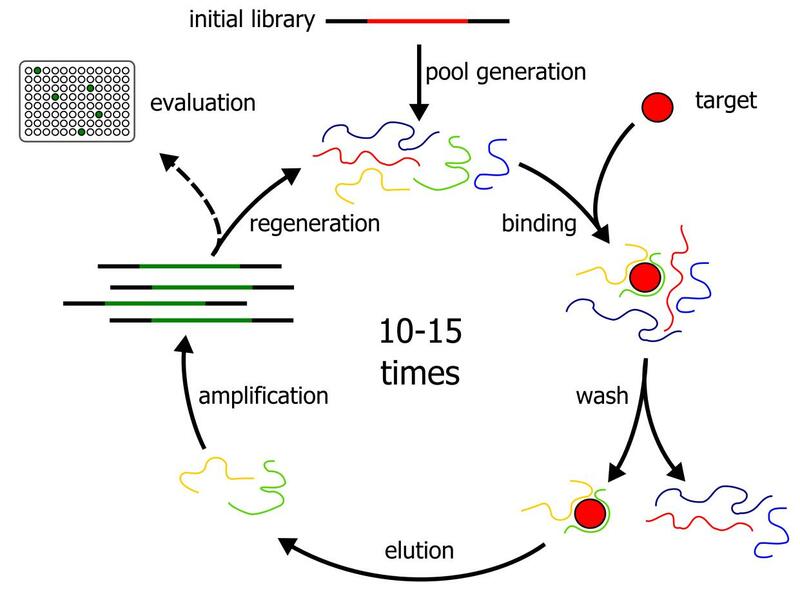 A variable starting pool of random sequences has to be prepared and after every cycle the candidates have to be mutated to further improve the binding to the target. All in all the process is rather inefficient. Probably this is the reason why there are still many small molecules and proteins for which no aptamer has been published yet. It has been shown that selected aptamers can be used to make the catalytic activity dependent on the presence of a ligand.Soukup1999 Fusions like that are called aptazymes. For this a catalytic domain has to interact via a communication module with an aptamer (Fig. 6). In presence of the ligand the aptamer undergoes conformational changes which results in an activation or inactivation of the catalytic activity. In our project we use different aptamers and combine them with catalytic nucleic acids to use them in various applications. In order to develop the necessary tools we need a fast and efficient way to generate new aptamers and aptazymes. To meet these needs we have developed two parts of software: One that generates aptamers from scratch (MAWS) and another one that joins them with an existing catalytic nucleic acid (JAWS) in an optimized way. This method not only is faster but also cheaper than existing methods. An aptamer connected via a communication module to an catalytic sequence; The communication module translates the interaction of the ligand with the aptamer to the catalytic part of the aptazyme. The Spinach Aptamer turns on fluorescence of its ligand upon bind it. Besides the above describes functional nucleic acids SELEX revealed aptamers which not only bind to a ligand but also are able to turn on fluorescence of different non-fluorescent dyes. An interesting example for an aptamer with such a special function is the Malachite Green Aptamer.Grate1999 In presence of malachite green the aptamer turns on the fluorescence of the dye.Babendure2003 In 2011 Jaffrey selected the famous Spinach RNA aptamer (Fig. 7). It binds a small molecule that resembles the fluorophore of the green fluorescent protein (GFP).Paige2011 Upon binding of the small molecule to the Spinach a green fluorescence comparable to that of the GFP is emitted. In our project we use variants of these fluorescent aptamers and engineer them to be dependent on small molecules of our interest. Though we so far mainly discussed functional RNA there are also both DNA aptamers and catalytic DNA which were selected using SELEX as well. As for today the concept of functional nucleic acids in nature has only been found for RNA. Nevertheless DNA aptamers and also catalytic DNA were selected in vitro. Secondary structure of 7-18 and 10-23 RNA-cleaving DNAzyme with substrate RNA. Cleavage site is indiacted with an arrow. To verify the prediction of the software MAWS we fused the calculated aptamers to a DNAzyme with JAWS and thus created a ligand dependent activity. For this we used the HRP-mimicking DNAzyme (Fig. 9) which was described in 1998.Travascio1998 It folds into a G-quadruplex that forms a complex with hemin and is then able to mimic the activity of a horse raddish peroxidase. Hence it is capable to produce reactive oxygen species (ROS) by the reduction of hydrogen peroxide to water. These ROS then leads to an activation of for example luminol which results in a chemiluminescent signal. In several of our subprojects we exploit this function as an easy readout such as for the AptaBody. Looking at the history of functional RNA in iGEM naturally occurring self-splicing introns were used by Team Waterloo 2011 to rejoin a split GFP posttranscriptionally. 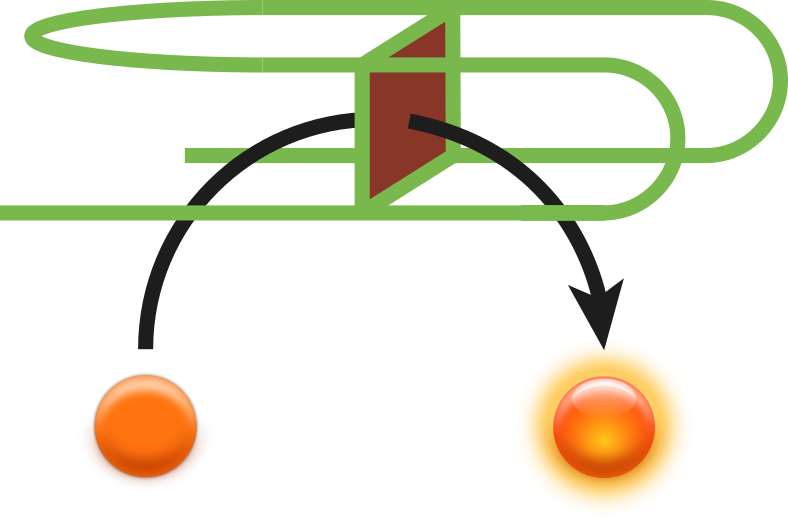 Riboswitches the natural relatives of aptamers have been used in several projects for example Cambridge 2012, Goettingen 2013 and also Bettencourt 2015. Hammerhead ribozymes have been discovered by several teams as handy tools (Peking 2011, Fudan 2012 and MIT 2011) and DTU Denmark 2014 worked with the Spinach aptamer. Although functional RNA has been used in some iGEM projects DNA or DNAzymes have rarely been mentioned before. Our project this year aims to modularize and standardize all these and many more parts. With our new BBF RFC 110 we simplify the work with RNA and thus want to encourage future teams to also dive into the world of RNA. By the addition and modularization of many DNA parts we want to stress to possibilities DNA possesses. HRP-mimicking DNAzyme folds into a G-quadruplex and assembles a hemin inside. IT catalyzes the reduction of H2O2 to H2O and thus lead to turn over of classical HRP substrates. By providing the community with tools for different applications, we contribute a foundational advance in the work with functional RNA. 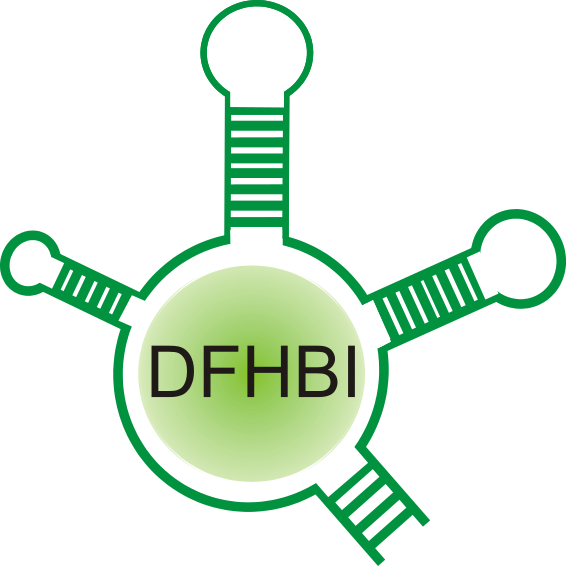 Not only is the system highly modular and therefore predisposed for standardization and usage in Synthetic Biology, the software developed by our team enables scientists to create aptamers and aptazymes de novo. Thereby we open up the world of functional nucleic acids to the entire Synthetic Biology community. Dive deeper now!